Articles about different golf courses. The great thing about The Masters golf tournament is that you really don’t have to like golf or even understand golf in order to really enjoy The Masters. Whether you are watching a broadcast or you are walking along the grounds of this historic piece of eastern Georgia real estate, there’s an element of class and prestige that emanates through your television, laptop, tablet or your smart phone about the atmosphere at the Augusta National Golf Club. That feeling starts as soon as you tune into the broadcast coverage or when you park your car and start walking toward the club. 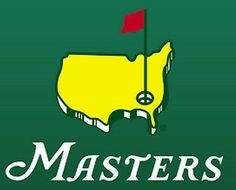 As an event, The Masters is truly in a class by itself when compared to other high-profile special events, whether it’s The Super Bowl, game seven of Major League Baseball’s World Series, the opening ceremony of the Olympic Games, soccer’s World Cup final, the Academy Awards, or a presidential inauguration in Washington, D.C. While those afore-mentioned events are ‘bucket list’ items to attend for millions of people, The Masters is perched on a different level. Simply put, it’s second-to-none, ‘a cut above the rest’ and as CBS states in its Masters promos, ‘a tradition unlike any other.’ And, everybody knows it – the players, the caddies, the patrons, the media, Augusta National’s membership, the current Augusta National Chairman, the current three major TV sponsors – Mercedes Benz, AT&T, and IBM – and the tournament’s two key international partners – Rolex and UPS. In a nutshell, it’s also fair to say that getting invited to play in The Masters is more exclusive than getting invited to be a member of the Augusta National Golf Club. While patrons truly enjoy attending The Masters, participants love playing in the event even more so. That passion for the event is why South African golf legend Gary Player, a three-time winner of The Masters, participated in a record 52 Masters tournaments before finally stepping aside and becoming an honorary starter alongside Jack Nicklaus and Arnold Palmer. Following the death of Palmer in September 2016, Player and Nicklaus now carry on the tradition of hitting the opening tee shots on the morning of the first day of the tournament. There are a number of aspects of The Masters, many of which are unknown to some of the tournament’s most loyal patrons. 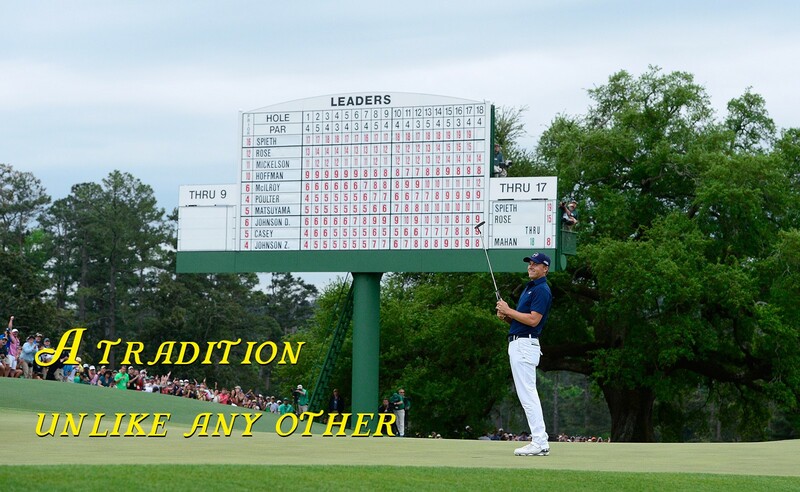 This confirms that The Masters tournament is ‘a cut above the rest’ and ‘a tradition unlike any other.’ And, it’s a position which Augusta National’s membership relishes and cherishes. Dinner Reservations. Winners of The Masters each year don’t have to worry about dinner that night because they are invited to join the members of the Augusta National Golf Club for dinner in the Trophy Room inside the clubhouse. The meal starts soon after the awarding of the Green Jacket inside Butler Cabin and on the 18th green, upon the conclusion of the tournament. Sleepover Special. While it’s well known that amateurs who play in The Masters each year are invited to stay in the Crow’s Nest, which sits at the tip-top of the Augusta National clubhouse, many people would be surprised that it sleeps five and is 1,200 square feet of living space. Trophy Time. The permanent Masters trophy weighs 100 pounds and it features the name of the annual winner of the tournament and the name(s) of the runner-up. The winner of The Masters receives a replica of the real trophy and a gold medal, both of which he is allowed to take home. The replica weighs only 20 pounds. The permanent Masters Trophy was built in England and features 900 separate pieces of silver. The Clubhouse. The Augusta National clubhouse predates the building of the golf course as it was originally a private home built in 1854. Keeping Up with the Jones’. In the first edition of The Masters (in 1934), then known as the Augusta National Invitation Tournament, Bobby Jones competed in the event, where he finished in a 13th place tie with Denny Shute and Walter Hagen. Jones’ 72-hole score was +6, which was ten shots behind the winner Horton Smith. Naming Rights. The credit for the naming of each hole at the Augusta National Golf Club is given to Louis Alphonse Berckman, Bobby Jones, and Clifford Roberts, who adorned each hole with a plant for which it is named. The course starts with Tea Olive (the first hole), though it was originally called Cherokee Rose, and concludes with Holly (the 18th hole). Arnie’s Plaque. On April 4, 1995, a bronze plaque, in honor of Arnold Palmer’s play and contributions as the first four-time winner of The Masters, was unveiled. The plaque is affixed to the water fountain which sits behind the 16th tee. Jack’s Plaque. On April 7, 1998, a plaque, in honor of Jack Nicklaus’ play and contributions as the only six-time Masters champion, was unveiled. The plaque is affixed to a drinking fountain that sits between the 16th and 17th holes. By Invitation Only. There are 19 different criteria which The Masters Committee uses to draft the list of players who are invited to play in The Masters each April. The Masters Committee, at its discretion, also invites international players not otherwise qualified. Previous winners of The Masters are automatically invited to return and compete every year. Who Is Rae? Rae’s Creek, which has a presence on the 11th, 12th, and 13th holes at Augusta National, is named after John Rae, who died in 1780. Rae’s house was the farthest fortress up the Savannah River from Fort Augusta. His house kept residents safe during Indian attacks when Fort Augusta was out of reach. The Green Jacket. The tradition of awarding The Green Jacket to the winner of The Masters started in 1949, when Sam Snead won. The tradition of the members wearing a green coat started in 1937. The jackets were purchased from the Brooks Uniform Company in New York City. Each Green Jacket is adorned with brass buttons. On each button, there appears the logo of the Augusta National Golf Club. Par 3 Tournament. The Par 3 Contest at The Masters was first held in 1960. The first event was won by Sam Snead. To date, no player has ever won both the Par 3 Contest and The Masters in the same year. The course record is held by Jimmy Walker who recorded an eight-under-par round of 19 in 2016. One special part of The Masters tournament is the fact that it’s a reflection of golf’s global growth in the last 50 years, especially since 1980, when a young Spaniard named Seve Ballesteros became the tournament’s second non-American winner. The first, of course, is Gary Player who prevailed on three occasions – 1961, 1974, and 1978. Since 1980, players from Germany (Bernhard Langer, twice, in 1985 and 1993), England (Nick Faldo, three times, in 1989, 1990, and 1996 and Danny Willett), Wales (Ian Woosnam), Scotland (Sandy Lyle), Argentina (Angel Cabrera), Canada (Mike Weir), Fiji (Vijah Singh), South Africa (Trevor Immelman and Charl Schwartzel), Spain (Ballesteros, again, in 1983, Jose Maria Olazabal, twice, in 1994 and 1999, and Sergio Garcia), and Australia (Adam Scott) have won this event. As an aside, 17 players have won The Masters at least twice, five of whom (Player, Ballesteros, Langer, Faldo, and Olazabal) are non-Americans. This story would be remiss if didn’t embellish a little on Augusta National’s three named bridges – the Hogan, Nelson, and Sarazen bridges. The Hogan bridge crosses over Rae’s Creek, allowing players to reach the 12th green. It was dedicated to two-time Masters champion Ben Hogan. The Nelson bridge crosses over Rae’s Creek, allowing players to reach the 13th green from the 13th fairway. It was dedicated to two-time Masters champion Byron Nelson. Both the Hogan and Nelson bridges were dedicated on the same day -- April 2, 1958. The Sarazen bridge crosses over Rae’s Creek, allowing players to reach the 15th green. It was the first named bridge at the course, dedicated to former Masters champion Gene Sarazen on April 6, 1955, as a way to celebrate the 20th anniversary of Sarazen’s famous double-eagle at the 15th hole during the 1935 Masters, which he won in a playoff. While so much attention is given to those who win The Masters, it’s also worth honoring the three players with the most second-place finishes. Hogan, Nicklaus, and Tom Weiskopf share the distinction of being four-time second-place finishers at Augusta. The French Lick Resort was built in the early 1900s and quickly established itself as one of America’s premier destinations. In its early days, French Lick and West Baden were a destination playground for the rich and famous. Like many business ventures, the French Lick Resort was unable to keep up with the changing times and business suffered in the 1970s, 1980s, and 1990s. 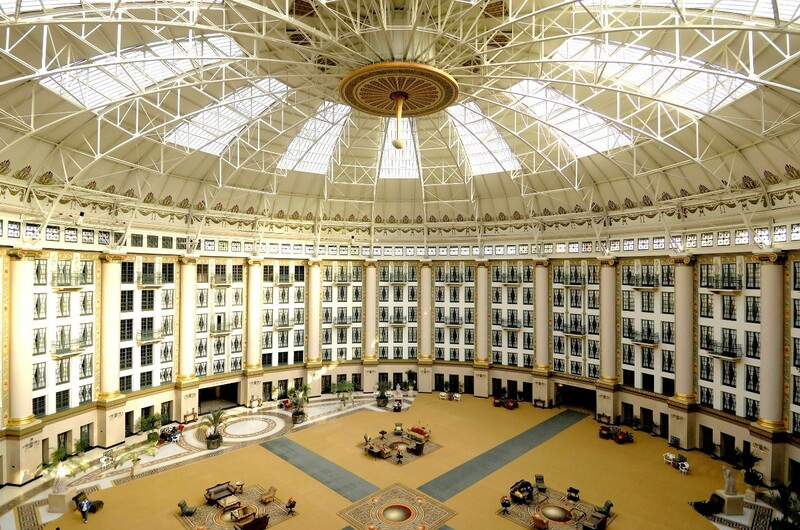 The French Lick Resort had lost its luster and the ‘bloom was off the rose,’ so to speak. But, that just meant the French Lick Resort was poised for a comeback. Enter successful medical professional and entrepreneur Bill Cook from nearby Bloomington. His Cook Group oversaw the infusion of enough funds to resuscitate this resort that had fallen on hard times. The property was literally falling apart. The West Baden Springs Hotel was in such bad shape that it once appeared on the National Trust’s list of 11 Most Endangered Historic Properties in the United States. But not for long. Restoration efforts on both hotels started in 1996. After a decade of work and nearly $600 million, the French Lick Resort opened its doors to visiting tourists and businesses from around the world. Business has been brisk ever since. The total restoration of this destination has been dubbed the “Save of the Century.” That may be an understatement! The main floor of the West Baden Springs Resort in French Lick, Indiana. The recreational appeal of the French Lick Springs Resort is now on par with resort competition around the country. It includes an indoor and outdoor pool, a six-lane bowling alley, bicycle rentals, horseback riding, and a 27,000-square foot spa. The area also boasts 5.5 miles of hiking trails and a 9-mile mountain biking trail. 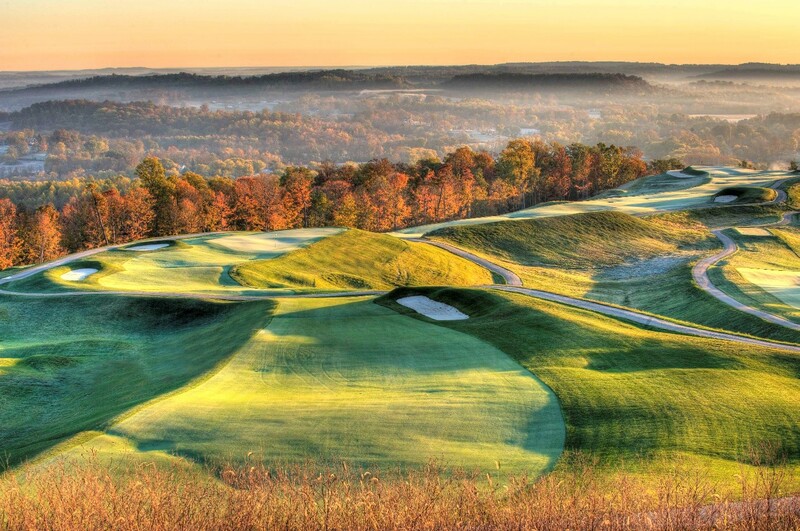 Today, golfers are spoiled at the French Lick Resort, as there are two world-class 18-hole championship golf courses in this small southern Indiana town -- The Donald Ross Course (originally named the Hill Course, opened in 1917) and The Pete Dye Course (opened in 2009). 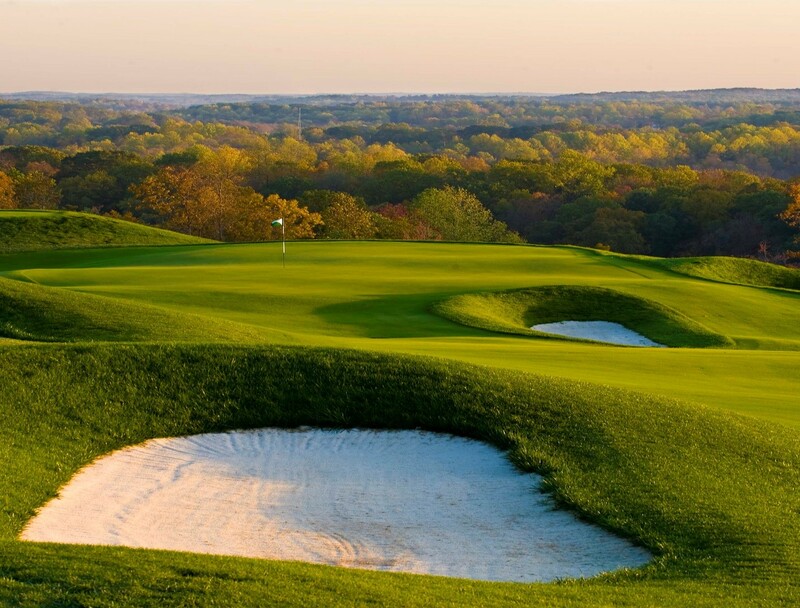 There’s also a nine-hole course – the Valley Links Course, designed by Tom Bendelow. As the names on the 18-hole layout suggest, both courses are named after their respective architects. It’s worth noting that the French Lick Resort is the only resort in the world which boats a classic Donald Ross design and a more modern Pete Dye layout. And, it’s only resort with two golf courses designed by two hall of fame architects. The Donald Ross Course is one of two public golf courses in Indiana which were designed by Ross. In recent years, the Ross Course in French Lick has been renovated, courtesy of a $4.6 million investment. It has now been restored to Ross’s original plans, which are brilliant. Many of the greens have false fronts, which are accentuated by the back-to-front slope of the greens. When you play this course, check out the configuration of the 8th green. It’s in the shape of a square, as many greens were, back in the day. After playing this course, you can understand why the 1924 PGA Championship was held here. It’s a true test of anybody’s ability to play golf. By the way, Walter Hagen won that year’s event, defeating England’s Jim Barnes, 2 up, in the final. The approach to the 14th hole at the Donald Ross Course in French Lick, Indiana. It’s worth noting what took place during the 1924 PGA. When the official photo was taken of that year’s field of contestants, both Barnes and Hagen appeared in the group photo twice – on both the left and right side of the picture. And, this was not accomplished with Photo Shop! Truth be told, Barnes and Hagen were able to run from one side of the group photo to the other as they were able to outrace the slow-moving camera used to capture the image of the 1924 field. That picture hangs on the wall of the clubhouse at the Donald Ross Course. By the way, the restaurant at the Ross Course is now called Hagen’s Club House Restaurant. Would that restaurant, which serves delicious breaded tenderloin sandwiches, now be called Barnes’ if the tall Englishman had prevailed back in 1924? The bar at Hagen’s has an interesting story. According to Brendan Sweeney, the director of golf media relations for the French Lick Resort, the bar is actually from the Chicago stockyards and was shipped down when the bar area at Hagen’s was built. On that bar, you will see a message that was carved into the wood by former gangster Al Capone. 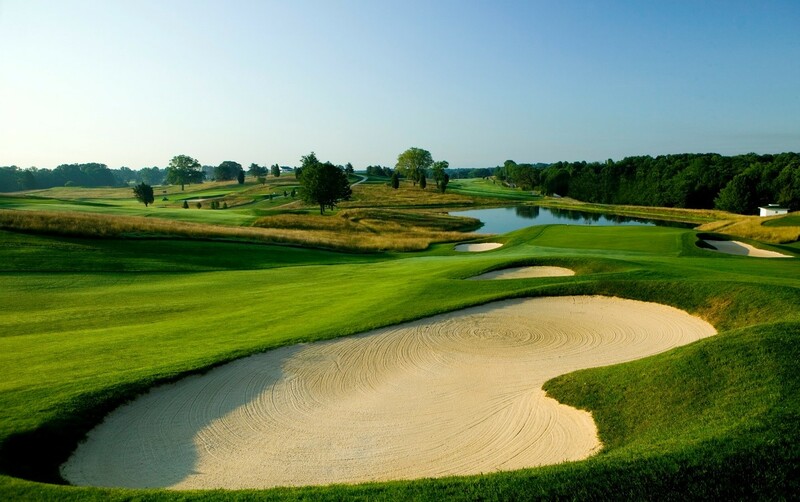 Besides that 1924 PGA, the Ross Course has hosted many high-profile golf events such as the 1922 Indiana Open, 1958 French Lick Open (LPGA), 1959 and 1960 LPGA Championship, 1983 Senior Open Championship, 2012 and 2013 Women’s Big Ten Championship, among others. The Dye Course, which includes three man-made lakes, was built on top of the surrounding hills. Many powerful adjectives have been used to describe the Dye Course -- breathtaking, dramatic, exciting, and spectacular, to name a few. The clubhouse on the Dye course is the old Taggart mansion. This hilltop peak is Mt. Airie -- 972 feet high and roughly 450 feet above the town of French Lick. When you arrive at the clubhouse, it’s Indiana’s second highest elevation point, but it probably has the best view of any vantage point in the Midwest. It’s Indiana’s own ‘Rocky Mountain High’ – a 360-degree view of southern Indiana and the surrounding Hoosier National Forest. From many parts of this golf course, you can see 30-40 miles in every direction. When Dye built this course, he wanted to give golfers a panoramic view of southern Indiana. He succeeded. After playing golf at the Dye Course, don’t rush away. Instead, have a bite to eat at The Mansion at the Pete Dye Course, where you can continue to enjoy the hill-top and birds-eye views of southern Indiana. A beautiful fall day along the back nine at the Dye Course in French Lick, Indiana. The 10th green at the Dye Course in French Lick, Indiana. The most dramatic stretch of holes is the early part of the back nine – 11, 12, 13, and 14. On 11, steer clear of the volcano bunkers which hug the fairway along the right. The 12th is a true three-shot par five with a massive green. The views of the area as you play the par-three 13th are memory makers. The 14th is the Signature hole. It’s a lengthy par five with a split fairway, divided by a massive green hollow. Pars are celebrated at 14. Another 18-hole course in the area that’s worth playing is Sultan’s Run -- located in nearby Jasper, a 30-minute drive from French Lick. Sultan’s Run was designed by Tim Liddy, a Dye protégé. Sultan’s Run features rolling hills, wonderful bunkering, and a scenic waterfall behind the 18th green. The 18th hole is the signature hole at Sultan’s Run and is named Supreme Sultan. Sultan’s Run is a brilliant creation. You would be hard-pressed to discover a better 36-hole golf experience than French Lick’s dynamic duo of the Donald Ross Course and the Dye Course. And, if you include Sultan’s Run, that’s a terrific trifecta. the Big Ten golf championships for men and women in 2015. The Dye Course is also the current host of the Senior LPGA Championship (presented by Old National Bank), which was first held there in 2017 and 2018 and is slated to continue on The Dye Course through 2021. It’s the first-ever senior major on the LPGA Tour, another historical moment at French Lick. Believe it or not, but the kitchen of the French Lick Springs Hotel is where tomato juice was created for the first time. It was 1917 and the chef needed a breakfast juice for his guests and he didn’t have any oranges left, only tomatoes. Hence, tomato juice. But, tomato juice is not the only great item that emerges from those kitchens. Dining options abound in French Lick. They range from fine dining to casual dining to grab-and-go. If you like steak, there’s no better choice than 1875: The Steakhouse, which is located in the French Lick Springs Hotel. Why 1875? It’s named after the date of the inaugural Kentucky Derby -- May 17, 1875. Another fun, fine dining option is Table One, the private chef’s table (for ten) in the kitchen at the West Baden Springs Hotel. From your table, you can watch the chef prepare your meal as you look through glass walls. Then, with the flip of a switch, the walls can become frosted which provides you with privacy and seclusion. If you want another combination of food and history, enjoy the breakfast buffet in the Grand Colonnade Family Restaurant in the French Lick Springs Hotel. This is where Franklin Delano Roosevelt received the nomination to run for President back in the early 1930s. In 2019, a sports bar is being opened. Since the restoration of the French Lick Resort by the Cook family, a number of awards, honors, and accolades have been bestowed upon this property’s meeting space, spa, casino, hotels, and golf courses by publications and organizations such as Golf Digest, Golfweek, GOLF Magazine, LINKS Magazine, Southern Gaming, Reader’s Choice Awards, Conde Nast Traveler, and U.S. News & World Report. The national recognition has been steady and strong since 2008. Historians have also taken note as both the French Lick Springs Hotel and the West Baden Resort Hotel are designated on the National Register of Historic Places. Suffice it to say, it won’t be easy leaving The French Lick Resort and its world-class golfing and dining opportunities – and its gaming and entertainment options -- but it will be easy making plans for a return trip to this getaway in the Hoosier National Forest.